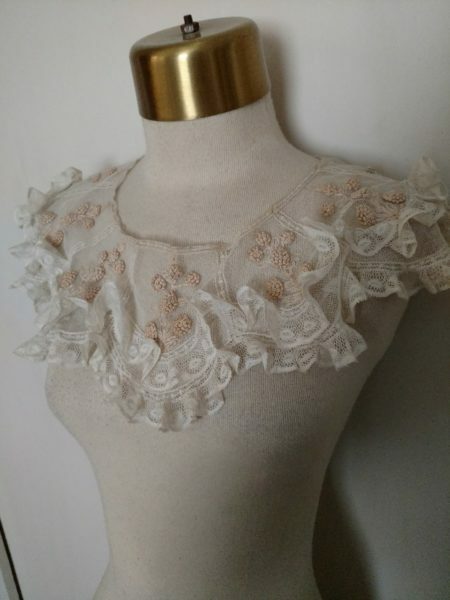 Such a gorgeous vintage dress collar. Dating from the 1920’s. This beauty is hand made with beautiful padded hand embroidered french knots. Fashioned with a round neck line, the collar is gracefully scalloped along the bottom edge. Two rows of narrow lace ruffles follow the curvature of the scallops. Tiny narrow lace separates the tulle netting into panels, the width of the collar. Each of these panels, are then embroidered with the french knots, raised and padded, to form flowers with leaves. Tulle color is off white with the thread of the flowers just a hint of pink. Tulle and lace are cotton. The embroidery is either a silk or silk rayon.